Leaders and members of the American Association of Physicians of Indian Origin (AAPI), the largest ethnic organization of its kind, took to Capitol Hill early Thursday morning armed with a compelling agenda. Topping the issues of prime concern were: immigration reform; increasing residency slots to help alleviate a chronic physician shortage in America; improving healthcare for South Asian Americans; lowering the exorbitant cost of prescription drugs; the recent repeal of the Individual Mandate in the Affordable Care Act (ACA), known as Obamacare, which could result in some patients losing health care coverage and a rise in premium for others. Powerful US lawmakers were all ears, applauding the advocacy efforts of AAPI activists. 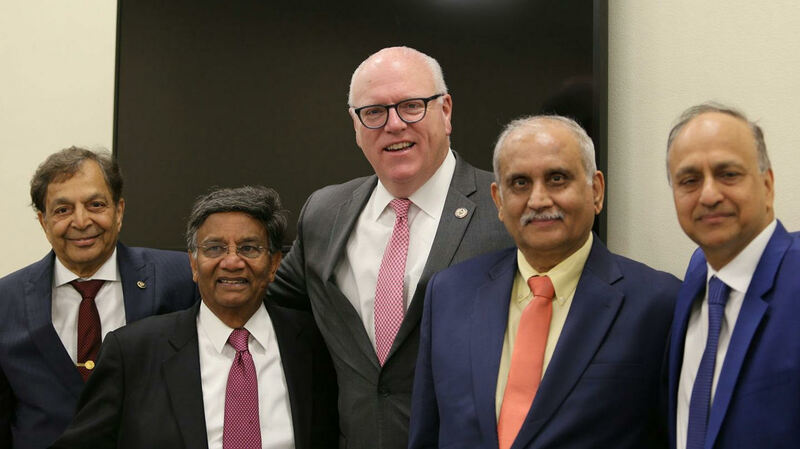 “I know you are hitting the Hill and you are hitting the Hill on a number of issues not the least of which is health care and your concerns about the direction of our country”, Democratic Congressman Joe Crowley of New York told a packed room of Indian-origin physicians in the Rayburn Building. “What really drives all of you is that you want to be able to carry out your profession in a noble way. At the same time, you want that respect which you deserve. More importantly, you want to save people’s lives, make the human condition better. That is incredibly admirable, something that is given short shrift”, he said. Crowley marveled at how the Indian-American experience has been different from other immigrant experiences, albeit with its own challenges. “There is an Indian doctor in just about every hamlet of the country”, he said to much applause by the gathering. “One of the great things about New York is that we produce one out of every six doctors in the United States”, he noted to more cheers. The lawmaker assured, “I continue to work to increase the number of slots here in the United States” and spoke of the GME (Graduate Medical Education) Expansion Legislation which he introduced with Republican Congressman Ryan Costello of Pennsylvania, in 2017. The bill calls for an additional 3,000 residency positions for five consecutive years. “It is important that we increase the slots because we are going to need more doctors, more technicians, more physician assistants, not less”, Crowley said. “The vexing issue for us is immigration”, noted the lawmaker expressing hope for some breakthrough in the near future especially as it pertains to DACA and the Dreamers including Indian-Americans who were brought to the country as children. “I don’t blame anyone for wanting to provide a better life for their children. So, I don’t cast blame or aspersion”, the lawmaker said. “We need to reform our entire immigration process and make it equitable and fair. We need to deal with the issue of H-1B and J-1 visas” and expand opportunities for highly skilled foreign workers and students, he told the gathering. “I still believe and always will that the United States will continue to grow. We need the best, the brightest and the bravest”, he said. About India-US relations, Crowley who has served as a co-chair of the Congressional Caucus on India and Indian-Americans, affirmed, “I believe it is the most important alliance of this century. We are in the second decade and we have seen incredible progress. I know that will continue”, he said referring to shared values including a dedication to the rule of law and democracy. Congresswoman Tulsi Gabbard of Hawaii, the first Hindu lawmaker to serve on Capitol Hill and current Democratic co-chair of the House India Caucus, told the AAPI gathering, “It’s been wonderful to see over the almost six years that I’ve been here in Congress how the relationship between our two countries has progressed. It has only continued to grow stronger and stronger. The commitment to continuing that momentum exists between both Democratic and Republican members of Congress and we’ve seen it cross between a Democratic administration and now a Republican administration”, she said. On the economic front, she revealed that in her home state, a Hawaii-Goa sister-state partnership will be formalized next month which is causing her colleagues in Congress to seek a similar partnership with other Indian states. The lawmaker noted that the bilateral “security relationship is also of paramount importance and that relationship has also continued to grow”. She acknowledged that “the H-1B visa issue is one of the biggest challenges facing the community” and lamented that a lot of people don’t understand the consequences of the backlog and continued effort to limit H-1B visas. “In Hawaii, an island state, we have a drastic shortage of physicians and it’s always difficult to get and retain doctors who can provide that care”, Gabbard told the AAPI group. “Your presence and your advocacy is very helpful as we try to construct substantive policy that best serves the American people”, she said. Among other lawmakers who addressed the 2018 Legislative Day event on Capitol Hill was Pramila Jayapal, the first ever Indian-American woman elected to the US House of Representatives. The Washington Democrat is one of four Indian-origin lawmakers serving in the current Congress together with Democratic Congressmen Ami Bera and Ro Khanna of California, and Raja Krishnamoorthi of Illinois. It is noteworthy that Jayapal introduced ‘The South Asian Heart Health Awareness and Research Act of 2017′ with her Republican colleague Joe Wilson of South Carolina to improve the cardiovascular health care of South Asian Americans. Speaking about the legislation on Thursday, she noted that with many Republicans as co-sponsors, “it is a bill that can actually move, that helps educate our community because frankly, we can be a little flip about heart health”. Stressing that the community has incredibly high incidents of heart disease, she believed that being able to use a few resources from the federal government to emphasize and target the South Asian community is very important. “I am going to continue to lift up health care for everyone”, she pledged. Born in India and having migrated to the US as a teenager, Jayapal is very vocal when it comes to immigration and upholding the rights of immigrants. “Unless you are native American, you came from somewhere and 92 percent of Asian Americans have come through the family immigration system”, she told the AAPI gathering. “This immigration system has been very important to us, not only the employment-based system, but also the overall immigration system that protects family-based immigration. And that is under threat”, she lamented. The lawmaker decried a proposal by the Trump administration to rescind an Obama-era rule which allows the spouses of H-1B visa holders to work. “Women who come with the very talented men are sometimes even more talented than the men themselves”, she said to much applause. “Cutting legal immigration by 25 million people over the next five years, a proposal which is on the table by the Trump administration, that is a non-starter for our community”, Jayapal asserted. “That would be deeply hurtful to all of the things that we are trying to do”. To AAPI activists, she said, “Thank you for your incredible leadership, for your advocacy, for your friendship, for your support. It means so much to me. When I come here it feels like I am coming home”. Congressman Wilson who joined her at the podium said, “I was not born in India, but I was born with an appreciation of the people of India. The lawmaker lauded the contributions of Indian-Americans, in particular Dino Teppara who has served as his chief-of-staff. Teppara, now a public affairs officer in the US Navy Reserve, was working closely with AAPI leaders – President Dr. Gautam Samadder, Legislative Chairman Dr. Vinod Shah, Legislative Co-Chair Dr. Sampat Shivangi, GWAPI representative Dr. Sudhir Sekhsaria – on a very meaningful Legislative Day on Capitol Hill. “I have seen Dr. Shivangi, Ramesh Kapur, Dr. Shah, Dr. Bharat Barai, knocking the halls of Congress before it was popular”, Congressman Khanna said at the event. “Now, it is very trendy to be Indian-American. You get invited everywhere. Everyone wants to meet with you. That was not the case earlier. These folks have dedicated their lives to being a voice for our community. They have dedicated their skill at it”, he stated, adding he is “so proud of all the doctors” as they “are the ambassadors of the community” even in rural areas. “Some of my favorite people in America are here in this room”, Congressman Krishnamoorthi said, looking around a venue packed with his supporters. “There is only one reason that I was elected to the United States Congress and that reason is you”, he stressed. “Like my family, you came to this country with nothing in your pockets, but you brought your culture, you brought your values, you brought your traditions, education, work ethic, and you worked tirelessly day and night. You are a success in the greatest country the world has ever known: the United States. And you are the pride of one of the greatest civilizations the world has ever known: India”, he said. The lawmaker made a strong pitch for Indian-Americans to become even more engaged – to vote, volunteer on campaigns, run for political office. Referring to an adage he often repeats, ‘If you don’t have a seat on the table, you’re on the menu’, Krishnamoorthi added, “We will not be on the menu if we do the needful” by being engaged in public policy. Democratic Congressman Frank Pallone, Jr., of New Jersey, co-founder of the House India Caucus, denounced the anti-immigrant fervor emanating from the White House. “Obviously, I’m not happy with the Trump immigration policy which is seeking to cut back not only on the undocumented Dreamers, but also legal immigration”, he said at the AAPI event. “If you look at the President’s proposals, he wants to cut back on immigrant visas, work visas, and political asylees so very few people would be able to come here if they have been persecuted for religious or ethnic reasons. I am totally opposed to all of this”, he categorically stated. “We need to have a pathway to citizenship for H-1B and J-1 visa holders, and for the Dreamers”, he added. The lawmaker spoke of a bill he introduced with two other House Democrats which would prevent the ACA from being sabotaged by President Trump and Republicans in Congress. He explained that the legislation eliminates the cap on subsidies, increases the amount that is available to help people pay their premiums, and seeks to stabilize the market by having a reinsurance component to get more insurers and create more competition to lower prices. He was hopeful the bill will pass if Democrats win the House and Senate in the 2018 midterm elections. Democratic Congressman Joaquin Castro who represents San Antonio, Texas, was applauded for supporting pro-immigration bill H.R. 392 (Fairness for High-Skilled Immigrants Act of 2017). The legislation seeks to clear the huge backlog for green cards by eliminating the per country cap which has left many highly-skilled workers from India in a quagmire with wait times for permanent residency anywhere between 25-92 years. Extolling AAPI members for their “incredible work ethic and strong family values”, Congressman Jim Costa declared, “It is immigrants who have made America the great country that we are”. The California Democrat revealed some interesting facts about the physician shortage in his District. “In San Joaquin Valley which I represent from Bakersfield to Modesto to Sacramento, we have 0.95 physicians for every 1,000 people, not even one physician for every 1,000 people”, he said. “The statewide average is 2.25 physicians. So, we are trying desperately, besides our Residency programs, to get a medical school in the San Joaquin Valley as part of the University of California system”. What is making a difference is that between Bakersfield and Modesto there are over 900 Indian-American physicians, he noted. “We are blessed to have a great Indian-American community with physicians so well represented”, Republican Congresswoman Barbara Comstock of Virginia said. Referring to shortages in the whole medical field — doctors, physician assistants, nursing homes – the lawmaker told AAPI members, “As we are an aging population, we are facing all kinds of shortages and I know you are on the front lines of that. If we could work together, I would be delighted to”, she said. Regarding soaring pharmaceutical costs, Comstock mentioned she is part of a bipartisan group in the House called the Problem Solvers Caucus which, among other issues, is focused on bringing down drug prices. “President Trump has indicated he would like to do something on that front”, she noted. “Unfortunately, in Congress, as you’ve seen over the past year, it has become an all or nothing thing. You are all in on everything about Obamacare or you want to repeal it. Trying to do something in the middle that would improve day-to-day health care for patients and for doctors got lost in that shuffle”, she lamented. Congressman Peter Roskam of Illinois, former Republican co-chair of the House India Caucus, spoke of the “enormous Indian diaspora in Chicago. Nearly every physician I meet is married to another Indian physician”, he quipped. “What is so interesting is how deeply connected and what a big leadership role these communities are playing in the Chicago area”, he said. “Our country is based on an idea and it is refreshed by people who come from all over the world. You could have lived anywhere in the world, but you chose America. And the United States of America is better off because you chose it”, he said. The lawmaker, who chairs the subcommittee on health on the Ways and Means Committee, encouraged AAPI members to provide feedback from a medical point-of-view about the obstacles they face in caring for their patients. As Chairman of the House Foreign Affairs Committee, Ed Royce stated he “has worked very diligently to improving US-India relations”. The California Republican who has made several trips to India, Pakistan and Bangladesh, envisioned a trade agreement between the US and all of South Asia, and called for liberalizing changes in policy that create economic opportunity for everyone. Republican Congressman Steve Chabot who represents Cincinnati, Ohio, said, “The relationship between India and the US is, I believe, one of our most important. We are natural allies. We have so much more in common than differences”, he said. The lawmaker spoke of fostering trade ties between the two countries and, while favoring legal immigration, felt the US should do more to keep people who have obtained an education here. Among other attendees at the AAPI event were: Republican Congressman Phil Roe of Tennessee, one of few physicians serving on Capitol Hill; Republican Congressman Mike Kelly of Pennsylvania; Republican Congressman Andy Barr of Kentucky; Maryland Delegate Aruna Miller (Democrat), currently running for Congress in the state’s sixth Congressional District; Jason Marino, Senior Assistant Director of Congressional Affairs at the American Medical Association; Dr. Naseem Shekhani, president-elect, Association of Physicians of Pakistani Descent of North America (APPNA); and Nuala Moore, Associate Director of Government Relations at the American Thoracic Society.